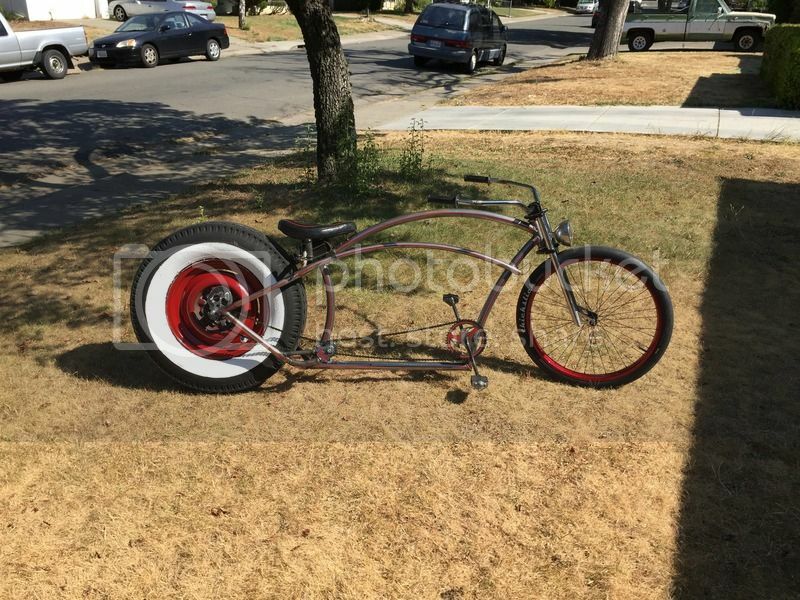 It's true that my latest bicycle build isn't a car or motorcycle, exactly, but I thought it appropriate to post it here, because I made the bike based around a car part. Specifically, a 40s Chevy 6 lug truck wheel, with a lovely old nylon 8-ply tire wrapped around it. 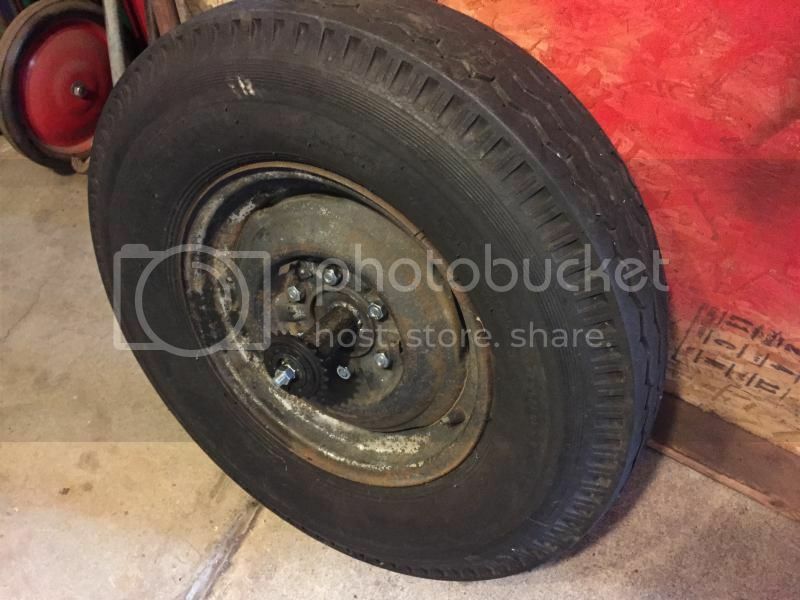 The tire is old, and too fragile to be on a truck anymore, and I got it from a neighbor for free, so I thought it would be a perfect candidate for a project that I'd been wanting to try. 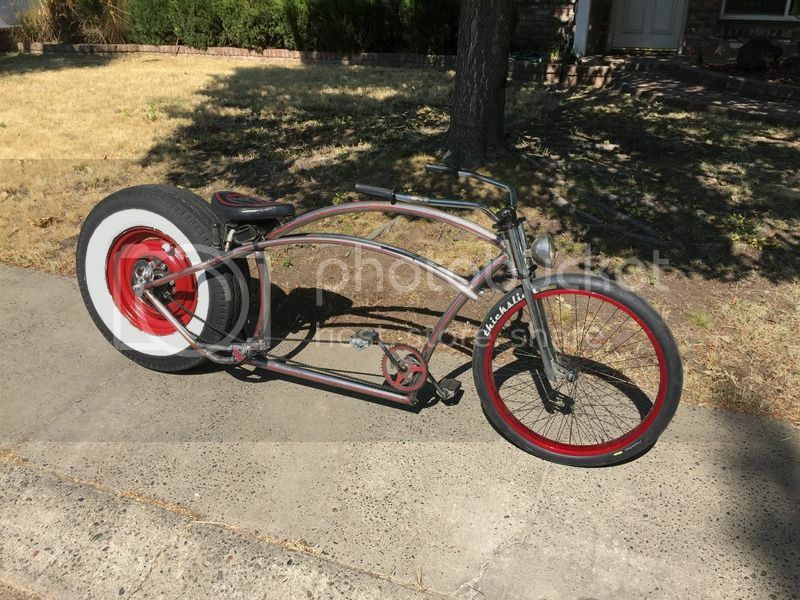 I pushed my fabrication skills further than I have in a long time, and built a bike around that wheel. I love the look of the squared off 8-ply tire, and I think it came out well. 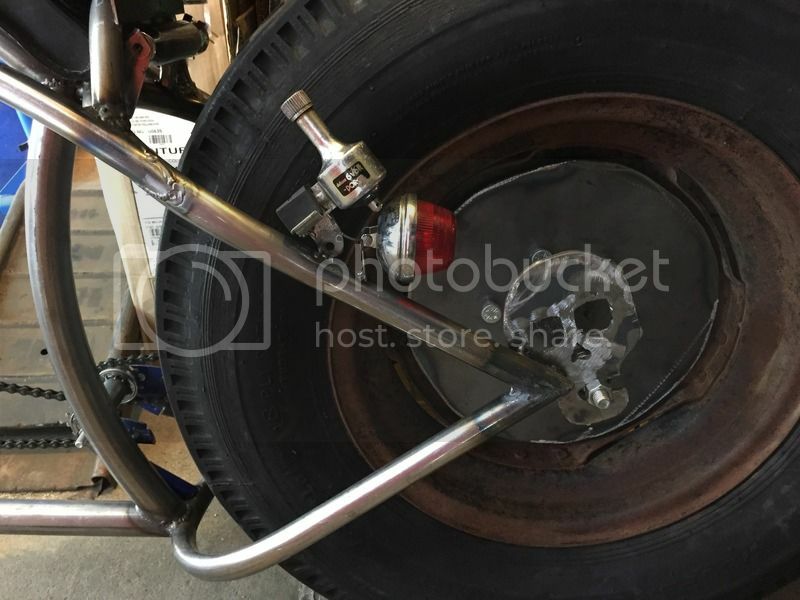 Once I fabricated the rear axle-mount for the truck rim, and built the rest of the frame from the back forward, I then put a motorcycle solo seat on it, for the ultimate comfort. Had to build a jackshaft to the rear, as it was much too wide to put the chain directly on it from the front chainring, of course. I finished it off by trying my hand at some simple pin striping, which will be the only paint that the metal gets. 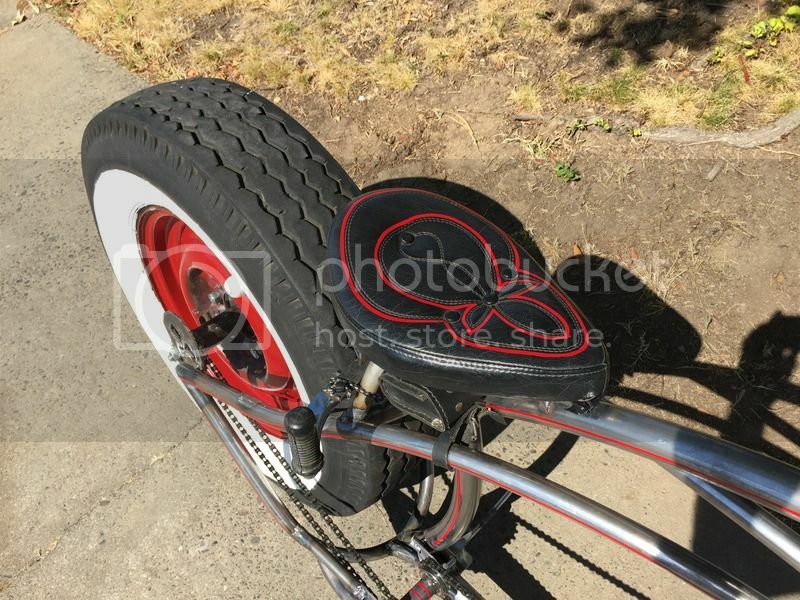 I also painted the rim red, and used some white wall paint that I got on ebay to give that old tire a new, rat rod look, inspired by the traditional hot rods of the 60s. I had a lot of fun with this one, and it's actually much easier to pedal than I thought it would be. I took it on a 10 mile ride this weekend. Hope you enjoy the pics. How much torque do you need to get that thing started? Your legs must be massive! Just found this. 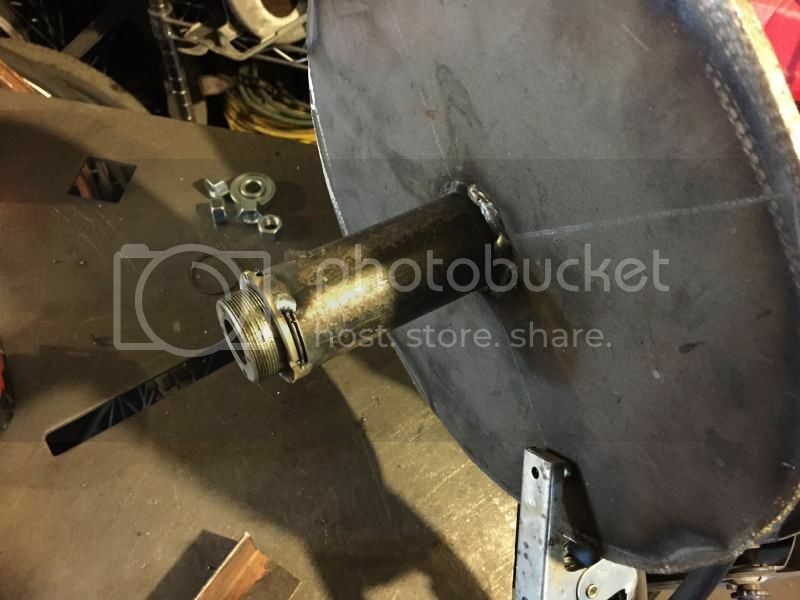 Nice work on the rear sprocket extension. The bike looks comfortable, with the forward pedal placement. Is that front end a motorcycle part? Also, I looked those Thickslick front tires up on Amazon - pretty rad looking. 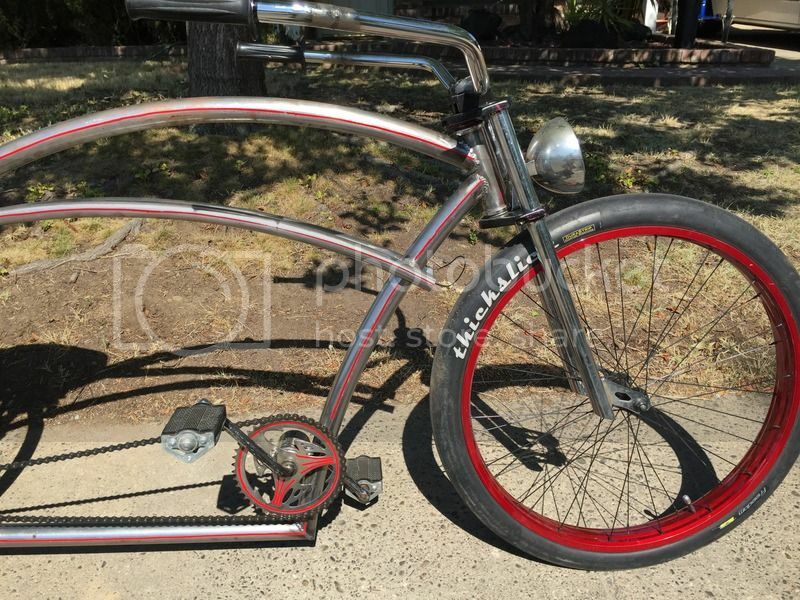 The front end is from one of those Chinese Walmart bikes from 10 years ago billed as an OCC Schwinn Stingray chopper. The seat is the only motorcycle part, I believe. Thickslicks are great looking tires. I happened to get a bike that had only one on it, so it was perfect for this build.